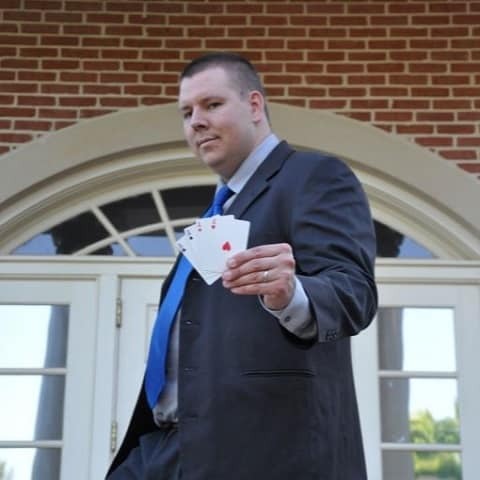 Magician-Aaron has over 2 decades of experience under his belt performing on stages all across the U.S.A. He is fully insured and provides event entertainment including: Magic and Illusions for stage shows, strolling close-up magic, parlor magic, and street magic. Aaron’s talents are sought after by events of all sizes from Fortune 500 companies, theme parks, corporate events, private parties, schools, libraries, day cares, nursing homes, and yes, even birthday celebrations. Master Magician-Aaron has never met an audience that he couldn’t get a jaw dropping reaction from! Any age group will enjoy Magician-Aaron’s amazing skills. His sleight-of-hand will mystify and amaze as he vanishes items right before your eyes then makes them reappear in the most unexpected places imaginable!